tl;dr There's a new interesting wrapper on Python multiprocessing called deco, written by Alex Sherman and Peter Den Hartog , both at University of Wisconsin - Madison. It makes Python multiprocessing really really easy. The paper is here (PDF) and the code is here: https://github.com/alex-sherman/deco. Apart from using simple decorators on functions, the big difference that deco takes, is that it makes it really easy to get started and that there's a hard restriction on how to gather the results of sub-process calls'. In deco, you pass in a mutable object that has a keyed index (e.g. a python dict). A python list is also mutable but it doesn't have an index. Meaning, you could get race conditions on mylist.append(). "However, DECO does impose one important restriction on the program: all mutations may only by index based." Let's put some logging into that slow() function above. That probably don't come as a surprise for those familiar with async stuff, but it's worth reminding so you don't accidentally depend on order. That works the same way. This could potentially be useful if you, on the next line, need to depend on the results. But if that's the case you could just split up the function and slap a @synchronized decorator on the split-out function. It might be tempting to not set the @synchronized decorator and not call .wait() hoping the work will be finished anyway somewhere in the background. The functions that are concurrent could be, for example, functions that generate thumbnails from a larger image or something time consuming where you don't care when it finishes, as long as it finishes. # And it's not expected to either. But if you dig deeper, you'll find that it never actually executes those concurrent functions. If you want to do fire-and-forget you need to have another service/process that actually keeps running and waiting for all work to be finished. That's how the likes of a message queue works. multiprocessing.Pool automatically, as far as I can understand, figures out how many concurrent jobs it can run. 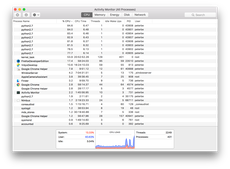 On my Mac, where I have 8 CPUS, the number is 8. This is easy to demonstrate. In the example above it does exactly 3 concurrent jobs, because len(list('123')) == 3. If I make it 8 items, the whole demo run takes, still, 5 seconds (plus a tiny amount of overhead). If I make it 9 items, it now takes 10 seconds. How multiprocessing figures this out I don't know but I can't imagine it being anything but a standard lib OS call to ask the operating system how many CPUs it has. So that way, the operating system doesn't get too busy. It's like a throttle. Let's actually use the mutable for something and let's do something that isn't just a time.sleep(). Also, let's do something that is CPU bound . A lot of times where concurrency is useful is when you're network bound because running many network waiting things at the same time doesn't hose the system from being able to do other things. It generates 100 different thumbnails from a very large original JPG. Running this on my macbook pro takes 8.4 seconds but the individual times was a total of 65.1 seconds. The numbers makes sense, because 65 seconds / 8 cores ~= 8 seconds. But, where it gets really interesting is that if you remove the deco decorators and run 100 thumbnail creations in serial, on my laptop, it takes 28.9 seconds. Now, 28.9 seconds is much more than 8.4 seconds so it's still a win to multiprocessing for this kind of CPU bound work. However, stampeding herd of doing 8 CPU intensive tasks at the same time can put some serious strains on your system. Also, it could cause high spikes in terms of memory allocation that wouldn't have happened if freed space can be re-used in the serial pattern. print "WOULD HAVE TAKEN", sum(somemute.values()), "seconds"
So, instead of it having to take 39.8 seconds it only needed to take 5 seconds with extremely little modification. I call that a win! Easy; actually build something that uses this. Initially I wondered why does the title say "really really easy". But when I tried - I found that this is "really really really extremely easy". Thanks for this. I've been waiting for something like this for years! ...and this is much better than I was hoping for. I've been waiting for something like this for years! ...and this is much better than I was hoping for. Thank you Alex. This looks interesting but I've really appreciated the flexibility of `concurrent.futures` for doing concurrent work in Python. Specifically, I find the `as_completed ` method makes it easy to write code that handles lots of work in parallel without having to handle the results in-order or block waiting for everything to finish: http://pythonhosted.org/futures/#concurrent.futures.as_completed . Uh?! Can you do fire-and-forget with concurrent.futures?! ...and then you can either call `wait` on it to wait for everything to finish, or use it in a with statement, which does that for you. The github https://github.com/alex-sherman/deco and your article do not mention which versions on Python are required. Do you have info on that? Pretty sure it's 2 and 3. At least 3.5. There exists a cpu_count() function. Useful if you want to limit yourself to say, 25% of available cores. I guess it simply calls nprocs on unix. so I guess a try..except is in order if you want to use this yourself. Not sure when the NotImplemented triggers, maybe it's a OS-dependent thing. It should be easy enough to not use iteritems. Is there a plan to make deco compatible with both python2 and python3?